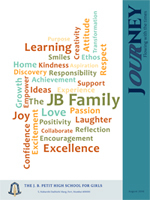 In our constant endeavor to 'Move Forward', the school recently launched "Journey" - JB's own e-newsletter. We hope to make this a bi-annual feature that will inform, showcase and highlight some of the significant events and activities of the school for each academic term. We hope you enjoy your JB Journey!